Bags are a must have for retailers no matter what type of merchandise they sell. Providing a way to package goods so customers can tote their new purchase home is a huge convenience that most of us take for granted. When it comes to choosing the bag that best suits your business needs, there are several factors to keep in mind; size, material, cost, sustainably made, durability, style and if they are easy to store. Here is a bit of information to help you choose the right bag. A t-shirt bag is simple to use and cost effective. Everyone has come into contact with the popular t-shirt bag at some point in their life. These plastic bags are cost effective and easy to store. 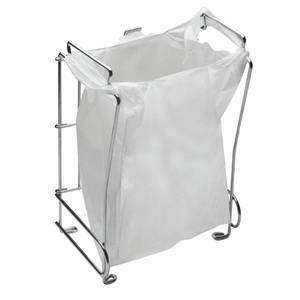 Retail associates will find that t-shirt bags are simple to use, especially when placed on a bag stand. Handles make carrying these plastic bags effortless and can be tied to prevent merchandise from spilling out on their trek home. Normally made of high density polyethylene, these bags are most often thrown away. Some major retailers provide bins to put these used bags in for recycling. Retail Resource also offers a 100% degradable t-shirt bag alternative in addition to the standard HDPE versions. With environmental concerns increasing, several cities have banned the use of plastic bags. 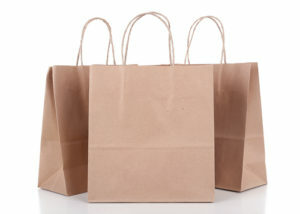 A variety colors and sizes are available in paper bags. Some of these bags can be a bit pricier; however more choices are available to accommodate various sized purchases. Higher end stores may want something a bit flashier than a simple brown paper bag to make a lasting impression for their business. Euro totes are available in colorful heavyweight paper and kraft paper with more of an upscale appeal. 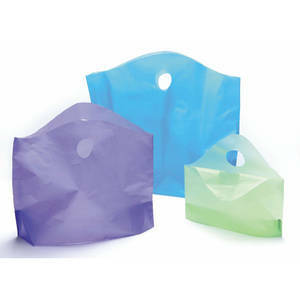 Customers can even re-purpose these bags as gift bags or use them again when they return to your store. Bloomingdales has proven that even a brown paper bag can be a great piece of advertisement for retail establishments. Paper bags can be re-purposed or used again when shopping. Bags have a lasting impression on customers. Plastic shopping bags are normally made of HDPE but in heavier thicknesses than t-shirt bags. Clear white and various color choices are available. Customers with a color scheme may want to provide these to help brand their store. As minor as they may seem, bags have a lasting impression on customers, they are the last thing the customers sees in the store and they are reminded of the store even when they go home. Even though technically some paper or plastic bags can be re-used, they eventually rip or tear. 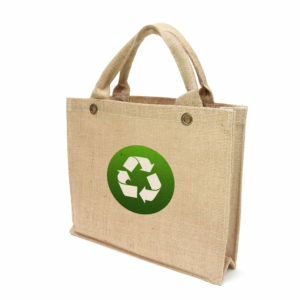 Jute shopping totes are attractive as well as re-usable. Constructed of natural jute with a laminate lining, making these bags moisture resistant and durable. 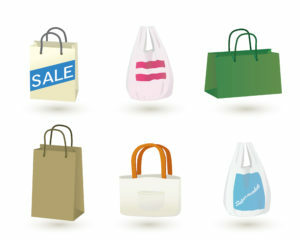 Retailers can sell or upcharge these bags to customers to offset the cost, or give them away with special promotions. If everyone used a re-usable shopping bag, the amount of waste sent to landfills would be significantly decreased. Jute totes are available in various sizes from Retail Resource. Reusable bags help decrease waste sent to landfills. Choosing the correct bag for your business needs may not be easy. Just remember to think about customer convenience, environmental impact and what fits the design and values of your store when shopping for your next case of bags.